Schiavello Manufacturing are a high end furniture supplier with offices in all Australian cities and an expanding international presence in Singapore, New Zealand and Abu Dhabi. Established in 1966 by Tony Schiavello, the company now employs over 1300 people and operates from 10 showrooms, six manufacturing plants and an award-winning headquarters in Tullamarine, Victoria. It is at this award-winning headquarters in Tullamarine, that Safer Storage Systems were called to conduct a racking audit on all of their existing racking in order to bring the racking in line with current Australian Standards and provide load safety signs throughout the premises. The current racking had been installed around 8 years prior and throughout this time had become damaged and potentially unsafe. In fact, the racking audit found that a large portion of the racking needed to be repaired or replaced in order to meet current Australian Standards. 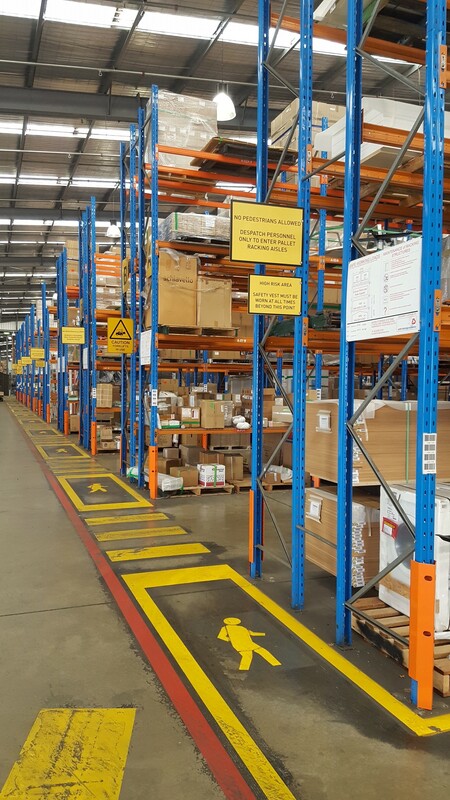 With no current load signage installed and a lot of non-compliant racking on the premises, Schiavello recognised the need to bring their warehouse up to date in terms of safety compliance. Schiavello also wanted to update their warehouse due to current stocking issues they were facing. Specifically, the current bay elevations were no longer suiting what they were storing due to new furniture ranges and changing stock profiles. The company’s natural product growth meant that they had increased and changed their furniture ranges over time and the racking just no longer worked for their growing stock needs. A rack inspection was conducted to determine exactly what needed to be replaced to bring the warehouse up to date with current Australian Standards and to be able to provide load safety signage. Safer Storage Systems also needed to work within the existing racking layout to update the warehouse to suit Schiavello’s current stock profiles and stock flow. This involved changing bay elevations and beam levels to suit the new stocking requirements. Bay elevations were also changed to ensure uniformity remained across the warehouse between existing and new racking. It was found that approximately 20-25% of the racking needed to be replaced. Safer Storage Systems replaced these damaged sections with the updated bay elevations using SSS racking. Rack protection was added to help prevent future damage and to avoid costly repairs and/or replacement in the future. Safer Storage Systems upright protectors were installed to prevent any future damage. These were installed on the front upright throughout the entire warehouse, with rear upright protectors planned for install at a later date. A second safety inspection was conducted after the works were complete to ensure Safer Storage Systems could certify that the racking is compliant with current Australian Standards, and that it is safe to operate under the weight in which it was designed. 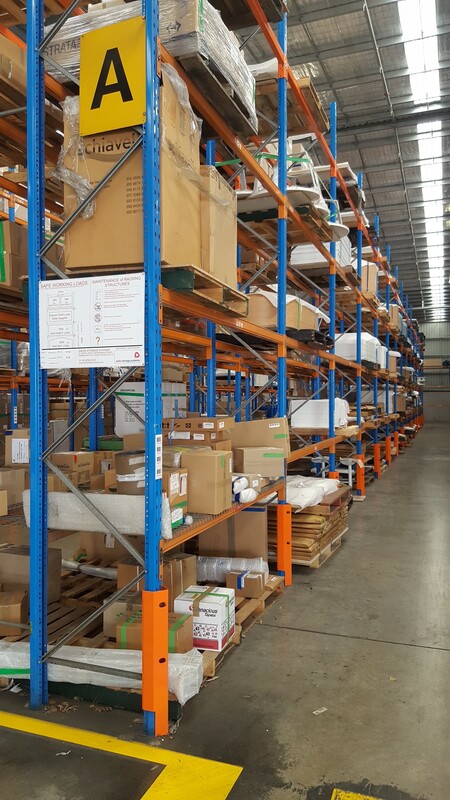 Safe Working Load signs were supplied for the load rating specified by Safer Storage Systems once all of the racking was found to comply and be in line with Australian Standards. Approximately 400 pallet spaces were created with the works Safer Storage Systems conducted, allowing Schiavello to comfortably store their current stock profiles which included bulky office furniture such as boardroom table and desks. 3 metre long beams were also installed to accommodate the longer product items such as the boardroom table tops. By utilising clever design that allowed the required changes to work within the existing racking layout, Schiavello saved on the cost of a completely new warehouse fitout. Schiavello Manufacturing have also committed to 6 monthly rack inspections to pick up on any damage before it becomes an issue and to avoid replacing thousands of dollars’ worth of racking in the future.